Rasco FR continues to protect those in the Electric Utility, Oil Field, Gas Field, Petrochemical, and Welders, other Workers from electric arc flash and flash fire hazards. 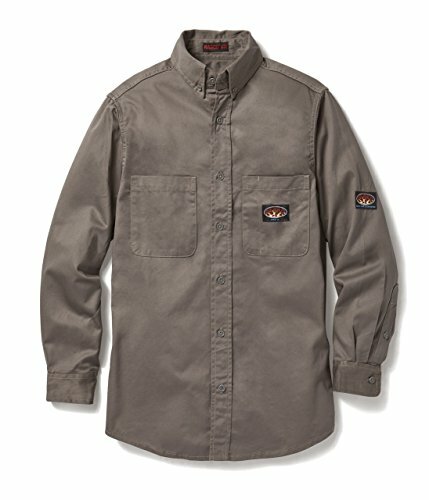 One of our new lightweight Flame Resistant Dress shirts , with buttons , comfortable for working in the field or just wearing to the office . Rasco FR is the leader in quality with keeping the end user in mind when it comes to cost . This FR Shirt helps save on the bottom line. HRC 2, ATPV 9.8 cal/cm2, NFPA 70E Compliant, Certified ASTM F1506 and NFPA 2112 by UL. Rasco FR Dress Shirts are made from 100% Cotton , 7.5 oz Twill . Our 100% cotton garments are guaranteed to be comfortable, and to be flame resistant for the useful life of the garment, provided that clothing care instructions are followed. Fire and Safety continues to bring you the best of Rasco MFG and stands by every Amazon Purchase . Check out our huge line of Flame Resistant Products on Amazon , have confidence that we will stand behind all of your purchases and you will enjoy your product. If you have any questions about this product by Rasco FR, contact us by completing and submitting the form below. If you are looking for a specif part number, please include it with your message.